The Lord's Church - "I Baptize you by Blazing Fire"
During 30 days of continual prayer at The Lord's Church in Seo Incheon, Korea, Pastor Yong-Doo Kim and his congregation experienced a revival that changed their lives. Equipping themselves daily with prayer and praise, the congregation had their spiritual eyes opened as they experienced healing, visions, intense spiritual warfare, and transforming encounters with Jesus. Divine visits and tricks of the devil, and more! Baptize by Blazing Fire gives you the tools you need to know the works of God, to achieve victory over Satan, and maintain faith that is dynamic and powerful. Pastor Yong-Doo Kim was born in Soonchun, Korea, and studied theology at the University of Anyang in 1991. As the pastor of The Lord's Church in Seo Incheon, Pastor Kim travels internationally sharing the testimonies from his church regarding the power of God. In this book, you will find an account of supernatural spiritual realities which took place in January, 2005. 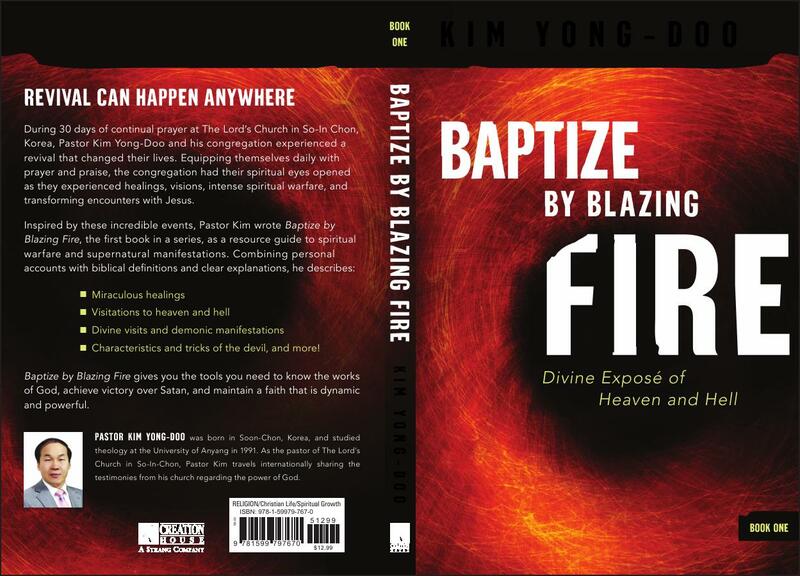 Both divine and visible realities of Heaven and Hell were revealed to the members of a small church in Korea. What makes this book unique is that the Lord Jesus gave this small group of people the gift of spiritual sight. They are able to see spiritual realities with their physical eyesight. They saw Jesus and heaven with their own eyes. They also saw numerous demons and hell. They experienced spiritual battles against demonic spirits while seeing them visibly. This book helps you to envision the spiritual realm as a very real world. This is not a book on theology book but rather a spiritual book. The author (pastor) obeyed the Lord when he wrote what Jesus revealed concerning the incredible mystery of the of the spiritual realm. I pray that you will be blessed by reading the book and also pray the Holy Spirit would help you to use this book to understand and fight the spiritual battle in your own life and church. Holy Fire Book 1 is recently translated in Russian! Holy Fire Book 1 is recently translated in Yoruba language! Read it for Free! Share and Distribute it! Welcome to The Lord's Church! Can Satan act personally at same time in many different places and realms? Response to "What does the Bible mean by ONE LORD? Fractal Praise: Praising God with the Beauty of Fractals. Copyright © 2009..2017 by, The Lord's Church. All Rights Reserved.